Bellfield Hall, by Anna Dean, is an English country home murder mystery set during the Georgian era (1805). 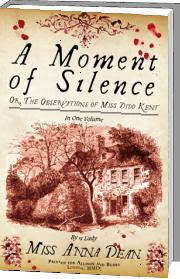 Miss Dido Kent arrives at the hall after her niece summons her there- she soon finds out that not only has her beloved niece's fiancee called off their engagement, but also that a woman no one knows has been murdered in the shrubbery. Dido promises to help her niece discover why her fiancee so abruptly called off their marriage, and in the meantime, she does some of her own sleuthing on the murder. I enjoyed this story. I don't think it was amazing (and I don't agree with Anne Perry's assessment that the mystery becomes "more urgent with every page," as stated on the front cover), but I think there is certainly room for the series to grow and strengthen if the author continues with it, and I'm looking forward to the next book in the series. Dido Kent is an intelligent and witty sleuth- she's not quite in the upper class, but she's also not in the working class. Thus, she can speak to people at multiple levels of society with ease. She also is often ignored because she is a spinster (we don't know how old she is, but I can't imagine she is over 30). In that way, I can see the comparisons to Miss Marple's kind and diminutive presence in Agatha Christie's novels. I give Anna Dean major credit for creating such an intelligent and easy-to-like female protagonist in this setting. So many authors, particularly the female ones, feel like they must make every woman some sort of crazy rebel, but Dido lives comfortably in her society and is at peace with it. While I liked Dido, I didn't think the storyline itself was all that great. There were some clues Dido didn't figure out for quite some time, even though there were clues that I picked up on (and I generally am quite dense for mysteries, sadly). As Dido is so intelligent, it was hard to believe she didn't catch onto those clues more quickly. There were also many red herrings in this book, and while I appreciated them, I think they served more as fluff than anything else. The story twisted and turned, but none of those twists were very surprising to me. There was also an entire storyline involving a Colonel and a young footman that either could have been completely left out or reconciled in a better manner. I didn't like this storyline or what it implied on multiple levels, and I don't think it was necessary for the story's success at all. I would have far preferred it to be left out, and I can only imagine that either the Colonel or the footman is integral to a later story and therefore it is necessary for some background to be provided. The other characters in the story were interesting, but not particularly memorable. I think this is often the case with mysteries, as you don't want to become overly attached to a possible murderer, but it is also disappointing. Several of the characters in Bellfield Hall seemed as though they would be interesting to converse with, and I wish I had gotten a chance to do so. This story reads very quickly and I think there could have been a bit more depth, but I think when there are so many characters to juggle, it's hard to do so. So while I think the story itself could have been better, I really like Dido Kent and I look forward to seeing more of her. I feel certain that as the author continues writing and getting to know her character better, that I will enjoy getting to know Dido better as well, and I look forward to the opportunity. I also like that this projected series is chronological- so I think if Dean can juggle the pasts of her characters and ensure that they continue to interact with each other in ways that move the story forward, then this could be a strong and entertaining series of books. Note: I believe in the UK, this book is titled A Moment of Silence. This is a much better title and very fitting for the story, and I wish it had been the title in the US as well. I don't know why mysteries set during a certain period of English history must have names that suggest the houses they take place in, but it seems to always be the case. 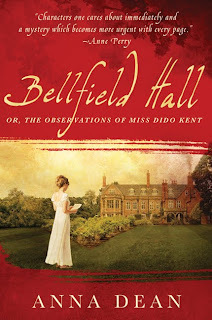 As soon as I saw the title Bellfield Hall, I was pretty certain it would be a Regency mystery. But A Moment of Silence is a title that would pique my interest much more. The UK cover is also better, in my opinion. Well, the paperback version, anyway. I love that cover - it is absolutely gorgeous! You had me at English Country home murder mystery. I'll skip the Colonel story part! Anne Perry is a murderer anyway so her opinion doesn't matter. I won't read her books. Why do book publishers insist on changing the names of books, so that the English version and the American version end up being seen as different books. I find it really annoying! This book is on my wishlist. I discovered it last week. Thanks for the review. Now I am looking forward to reading this. This sounds wonderful to me. I like the covers of both of these books. Carrie- It is :-) I prefer the UK cover, though! bookmagic- That is almost word-for-word what I said when I was offered the book to review. Except I said, "You had me at Regency mystery." Vivienne- I find it very annoying, too, especially as it often implies a lack of intelligence in the US audience. Andreea- Ooh, I hope you get a copy soon! Diane- Yes, I think you'd like it, based on what I know of your tastes. Hmmm...I can't decide if I'll like this one or not. What do you say? I only found out about Anne Perry recently too! My mother has several of her books and I'd always thought she wrote rather sweet little mysteries. Which I guess she still does, but dude, she killed her friend's mum! Very, very shady. Blodeuedd- Yes, it makes it seem much more eerie! Eva- I'm not sure, either! It's a really quick read. I bet it wouldn't take you over an hour or two. It's not a complicated read, but I think you would also be really upset by the Colonel thing. Jenny- It's a fun book! The faults, I think, will probably lessen as the series continues. Hey Aarti! You know what is really B-zarr? I have tried to add your URL to my blogroll list for months now (and just tried again) and for some reason it won't add! ANYway, this is why I haven't visited for awhie, but will now just add your blog as a favourite on my homepage of my internet. Hope you are doing awesome! Great review! I've been trying to decide if I want to read this or not. It seems right up my alley and you really went it to depth on a lot of points! Thanks so much! I don't read many of these types of books, but your review does make me want to consider this series. It sounds as though it has it's problems, but I also get a feeling that reading it would make for a very diverting afternoon. I also like the fact that it moves quickly, as most of my recent reads have been of the denser variety. Great review, I am thinking of exploring this book further!